Box of 20 cards and 20 envelopes.
" Nature wears its emotions in flowers. Witness Spring arrayed in glorious blooms suffused with every imaginable shade. Indeed, who has not seen a summer field of cheerful sunflowers and not felt like wearing their smiles? Or, passing by a somber garden of dusky red and pink roses cloaked in twilight, who has not felt th pang of bittersweet longing for past loves and dreams lost, now only half-remembered? Their powers are subtle but potent. In myriad palettes, textures and scents, flowers take us to distant, unknown shores.... or deep within ourselves, to burning wishes, to subdued griefs, to our very soul. 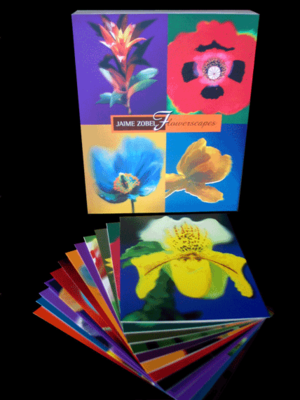 In Flowerscapes, noted photographer Jaime Zobel again brings together a collection of his woks. With each an intimate revelation of a particular bloom, one is struck by the lush, brilliant colors that almost seems to mimic the velvety feel of petals. Zobel's passion with nature and with the captured image has already produced several award-winning books, such as Homage and The Island. He noted once that his photography has gradually evolved over the years: from simply satisfying his need to hold alive a perfect scene, to inviting his viewer to share his emotion at that shot's taking, as well as giving room for interpretation. Thus, in Flowerscapes, ZObel captures and conveys a particular mood with each photograph. With this is the invitation to carefully consider, and perhaps to relate to the flamboyant sprig or to the bashful blossom. Collaborating with Zobel is Francisco (Dopy) Doplon, a multi-awarded art director and a respected name in the graphics design industry. Doplon, no stranger to the intricacies of Zobel's artistic vision, vividly breathes life to each flowerscape. Moreover, he accomplishes this with his unique touch of grace and elegance. Thus, with Flowerscapes, Zobel and Doplon bring the viewer to a journey of emotions and sensations articulated in the language of flowers."